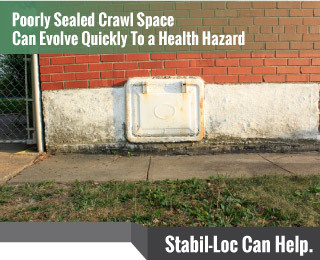 The foundation wall around a crawl space, sometimes known as the skirting, can sink or become uneven over time. This is most noticeable if the bottom level of your home has sagging floors with the presence of exterior cracks. Sinking footing can sometimes be caused by the columns which provide support being placed too far apart. In some cases, the joists, girders, and posts made from wood are rotting due to moisture intrusion. The low quality of the soil’s conditions around the perimeter of your home might cause the foundation to become too weak to hold up the mass of your home. Jacks, piers, and other stabilization measures can be taken to make sure your foundation’s structure is adequately strengthened. In the event your damages are due to issues with excess runoff, your Stabil-Loc authorized professionals will install a drainage system (usually perforated pipe set in gravel) around the perimeter of the house. Moisture from the ground enters the drain layered within the gravel and will be forced away from the footing. No one sets higher expectations than those we place on ourselves. We will always provide professional service and outstanding customer service. Please call your local Stabil-Loc Authorized Dealer today for a free no-obligation appointment.